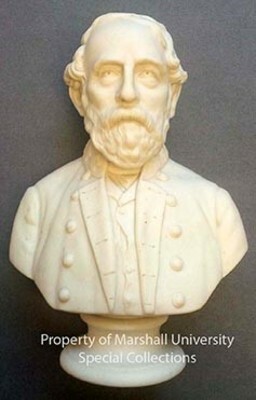 "Media Type: Bust (fired porcelain casting)"
Bust of Gen. Robert E. Lee of Parian ware, manufactured in England in 1864. Produced for the Liverpool Bazaar of the Southern Independence Association, to raise money for the Confederacy. This depiction of Lee is referred to as the "open coat" pose, from a photo of him in late 1863. Stamped on the back: "General.Lee." Parian ware was invented in England in the 1840’s, and was also known as “Statuary porcelain.” Figures and busts were frequently designed to imitate carved marble. Ca. 1864, item # RAB1.979, height 9.5 inches.